This personalized nautical print features an anchor drawing with your family name and hometown. When your family likes to celebrate the sea, home is wherever you drop your anchor. 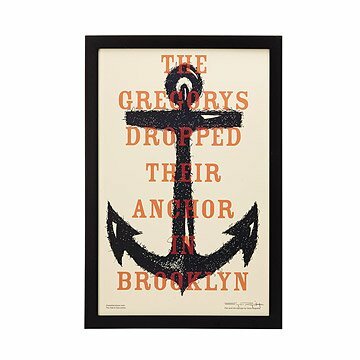 This nautical print from an original design by Gene Rogovitz features the lively lines of a hand-drawn anchor layered with custom text. Personalize it with your family name and hometown to honor your favorite port of call. Designed and printed on Long Island, New York. Gene Rogovitz studied at the Fashion Institute of Technology, where he received his degree in Graphic Design. He went on to receive his Masters in Art Education from CW Post, and is now a Technology teacher at West Babylon High School teaching Graphic Communications. His vision is to capture the essence of the ocean and its many components, inspired by the variety of salt-aged goodness that lives and thrives in the sea. With over 25 years spent surfing—both locally on Long Island and in many locations worldwide—he draws from this major influence in his life.